When Revd. Professor Kemmyo Taira Sato (a Shin Pure Land Buddhist priest who attended the launch of the Peace Mala) informed Pam Evans that he would be the English and Japanese interpreter for his spiritual master Venerable Chimyo Takehara during an audience with the Dalai Lama, she asked him if he would kindly deliver a Peace Mala with teachers guide and letter to His Holiness on behalf of herself and the students of Coedcae School. Professor Taira promised that he would do his best. Professor Taira later described his meeting with His Holiness as "At once so cheerful and so spiritual; so full of love and warmth and light." Peace is not something which exists independently of us, nor is war. The political leaders, policymakers and army generals who have responsibilities with respect to peace are members of our own human family, the society that we as individuals have helped create. Peace in the world thus depends on peace in the hearts of individuals. I am happy to endorse the Peace Mala particularly because it involves the participation of young people and also because the launch of it was led by the Most Revd. Dr. Rowan Williams, the then Archbishop of Wales. I wish the Peace Mala continued success. His Holiness the 14th Dalai Lama , Tenzin Gyatso, is the head of state and spiritual leader of the Tibetan people. 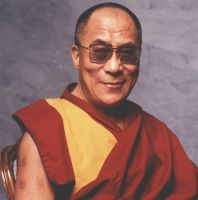 Every Tibetan has a deep and inexpressible connection with His Holiness the Dalai Lama. To the Tibetans, His Holiness symbolises the whole of Tibet: the beauty of the land, the purity of its rivers and lakes, the sanctity of its skies, the solidity of its mountains and the strength of its people. His Holiness is a man of peace. In 1989 he was awarded the Nobel Peace Prize for his peaceful struggle for the liberation of Tibet. He has consistently advocated policies of non-violence, even in the face of great aggression. He became the first Nobel Laureate to be recognised for his concern for global environmental problems. His Holiness describes himself as a simple Buddhist monk. In his lectures and tours around the world, everyone who meets him is visibly touched by his simplicity and good natured warmth. His message is the importance of love, compassion and forgiveness.